Meanwhile, here's a story about Partic Parkey and Harrell Gabehart's Dolly Parton collection. by respected writer Alanna Nash for MSN Entertainment. 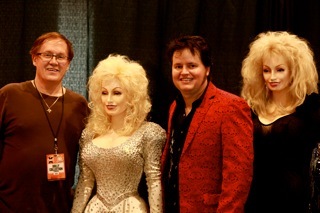 Patric Parkey (left) is an "uber" Dolly Parton fan who recently brought his collection — via Stephen Shutts (right) of Rockology — to the 2013 CMA Music Fest in Nashville. In 1998, Patric Parkey bought one of Dolly Parton's dresses at an auction. It wasn't such an unusual move for a die-hard Dolly fan who spent his Saturdays as a 5-year-old "lyin' on the floor with the family, watchin' 'The Porter Wagoner Show' on a black-and-white TV." But then just like "A Habit I Can't Break," the title of one of Dolly's 1972 songs, with the acquisition of that first dress, a beaded relic from Parton's 1980s television show, Parkey was hooked. Bad. He'd been collecting Parton memorabilia for 15 years already, but with the Tony Chase original under his arm, "It kind of snowballed," he says. Today, it's taken over the retired office worker's life. Parkey, 54, and Harrell Gabehart, 53, a restaurant prep cook ("I Dolly-ized him," Parkey says of his partner of 24 years), own some 30,000 to 40,000 Dolly items. The collection includes such holy grail pieces as the singer's king-sized bed, a plethora of her wigs and stage wear, and even her castoff Christmas tree, still decorated in lights and tinsel nearly as sparkly as the lady herself. They keep it in their master bathroom Jacuzzi tub, because there's no room for it anywhere else. Parkey estimates he spends 10 hours a day caring for the collection, which he and Gabehart spent approximately $250,000 accumulating. It's worth, they estimate, $500,000. At least one other estimate pushes that number higher. "Dolly's from top to bottom, wall to wall, and in every bathroom. I've got some wig heads, and I don't have a place to put 'em. A lot of 'em are in the bathroom. I'll have a friend come over, and they'll say, 'I can't use the bathroom with her starin' at me.'" There are so many Dolly pieces crammed into the couple's three-story, 2,800-square-foot cabin in Pigeon Forge, Tenn. -- where they moved three years ago from Euless, Texas, to be closer to Dollywood -- that in 2011, when Dolly herself came to take a look at the life-size cutouts, the framed letters, the original title from one of her old cars, and the rows of dainty shoes in size 5 ½, "She just couldn't believe it," Parkey remembers. "She just stood there, speechless. I ain't never seen that before." The moment was preserved for a cable TV special, "My Collection Obsession," on TLC. "Every little book, every little card. And pictures!" Dolly said when she finally found her voice. "It's just fascinating. Even I can't keep up with my stuff like that." The highlight of Parkey and Gabehart's collection is undoubtedly 40 original outfits they've accrued through auctions and fellow collectors in the U.S. and Europe. A number of them, like the $10,000 rhinestone-encrusted top, skirt and boots (also designed by Tony Chase), are iconic in Dolly world. The ensembles range from everyday clothes, to outfits Parton wears on her album covers, to stage and TV costumes. "I'm not aware of anybody who has that many stage outfits of one artist," says Stephen Shutts, a music and pop-culture memorabilia specialist whose company, Rockology, curated and exhibited a fraction of the collection June 6-9 for the Country Music Association's CMA Music Festival in Nashville. Shutts, whose "Raiders of Rock" show bows in September on the CMT cable channel, calls it "clearly the largest private collection outside of Dolly's personal holdings. And it covers five decades of her career, so you get the gamut of styling, fashion and imagery, all somewhat flamboyant." And then some. The rarest item in the collection is an outrageous costume Parton wore to her former manager's Halloween party in the '80s: a pink spandex suit in peacock-feather print, with a peacock beaded on the back of the matching fringed jacket. Real peacock feathers festoon the accompanying mask and shoes. The couple displays the costumes on full-sized mannequins of Parton, replete with blond Dolly heads and what Shutts calls her "most famous assets." Parkey commissions the figures from a maker in California at a cost of $2,000 to $3,000 each. Parkey and Gabehart were searching for display cases when they met Shutts several years ago. When the entrepreneur first asked them to exhibit items from their collection in Nashville this summer, Parkey was "petrified." The treasures had never been out of the house, and he and Gabehart were even protective of their address. It was Dolly who made the difference. "When I told her," Parkey remembers, "she said, 'Oh, that would be great! The fans would love it!' So I said, 'OK, Stephen, let's do it.'" Dolly has met Parkey and Gabehart at so many Dollywood events through the years that she crows, "Here's my boys again," when she sees them. It's a family feeling, Parkey says. And so he felt comfortable approaching her last month about perhaps setting up a Dolly museum in Nashville. More than 400 fans signed a book at the recent CMA Fest saying they'd support it. "She doesn't know how much money we've spent, but she's a businesswoman, so she said, 'Go ahead. It's time for you to start makin' money.' I was feelin' bad for tryin' to make money off it, but she gave us her blessing." If Parkey and Gabehart succeed in establishing the museum, Parkey wants to recreate Parton's old Dollywood apartment, which was dismantled to make room for corporate offices. He still needs the bathtub, though he already has most of the furnishings, including the custom-made iron bed frame, a more recent acquisition. "When Dolly came to our house in 2011, she said, 'Honey, did you get my bed?' I said, 'No, ma'am,' and her face went from bubbly to oh-oh.'" Parkey wasn't interested in paying $10,000 for a bed frame without the mattress that Dolly had actually slept on. But he had erroneously been told the mattress was destroyed. "She just looked at me and clicked her heels, and then she said to her people, 'I imagine we can find that mattress somewhere, don't you?'" The original mattress was available after all, which soothed over a tense moment. "Before she realized what I was saying, she went to laughin', and she said, 'Honey, you don't want my mattress? I don't have no bedbugs!' I grabbed her arm and I said, 'Dolly, as long as they're your bedbugs, I wouldn't care.'" Alanna Nash is a New York Times best-selling ghostwriter and author. She has also written scores of magazine articles for Vanity Fair, People, Rolling Stone, USA Weekend, and Entertainment Weekly. Her office is lit by two lamps that once adorned the living room of Graceland, and she saw the Beatles live in concert three times.